The L.A.W. in London: Yeah, Baby. In the last episode of The L.A.W. & Ronovan who met Ms. Marzapan and Hugh in a skytower or something like that, um, there was like this zombie dance troop and the L.A.W. and Ronovan, I mean me, I mean I discovered that Cyril Bussiere had created all these mind altering things to get rid of like all the Hugh’s of the world. I secretly think it’s because he is jealous of Hugh’s, well I won’t tell that now. Just wait. I just hope we catch him before that housekeeper that he left behind without a job does. Oh, and the Doctor showed up to give us a ride to London. “Well that certainly was a bumpy landing,” the Doctor said. “Indeed,” Elena said. She had taken on a British accent for some reason. Actually all of the L.A.W. had. I feared that if music started to play they would tell me what they want what they really, really want. But the door opened just in time. We apparently had come to rest in some type of store. We all turned to follow her very excited finger. “Ruby slippers!” Kate said. She dove for them but they disappeared as her hands grasped nothing but empty air. Stinky empty air. “What is that awful smell?” Amira asked. “Smells like Troll feet,” I said. “That’s because that is precisely what it was. Internet Troll feet,” the Doctor said. “Oh, Doctor, I am so glad you came,” a woman said. We all turned. I looked at the Doctor. He looked at me. He went into the blue box thing. And then, gone. I couldn’t blame him. I didn’t get the words out of my mouth before I found myself being tackled to the ground by several tough women. One that looked like a train. And one with a—Rudolph nose? We all stared at the man with the thick glasses, mop top hair and extremely tight pants. “It can’t be,” I said. “Oh but it can, baby. Well, you’re not a baby, that’s just one of my catch phrases. Unless, wait you’re not a man!” Suddenly the insane1960s reject was trying to pull off my shirt and my hair. “Austin Powers, get off of him,” Ms. Maple said. “Austin, I told you never to call me that in front of people,” Ms. Maple said. I had only seen her on Skype but I didn’t think the red flushed complexion was her natural look. Ms. Maple giggled like a school girl. I looked at the others and saw various reactions from the rolling of eyes to dry heaving. There was even a reindeer being used as a gag to not laugh. I just hope it had not been tried on for a fitting. “Should we ask him why he is here?” I asked. “I say no,” Amira said. “Agreed,” everyone else said in unison. “Oopsie,” Jenna said. Her smile flashed. “For sure, right?” she said. “Oh, right. Healthy Oreo cream,” Kate said. “Not so healthy,” I said. Amira was right. “And, we found blueprints,” I said. “For what, a death ray?” Amanda asked. “A sting ray?” Eloise asked. “A blu ray?” Cat asked. “Cat!” the rest of the L.A.W said. “Mind controlling helmets that look like bowl cut hairstyles,” I said. “We can only stop all of this one way,” I said. “How?” Seven female voices asked in harmony. Amanda smiled, tilted her head to the right and gave her trademark look. “I know,” she said and pointed. We all turned to follow her obviously mommy finger. The psychedelic painted Mini Cooper. “Oh yeah, baby,” Amanda said. I just had time to turn before Amanda ripped the onesie off. I hung my head and just hoped that this would all be over soon. I had no idea crossing the ocean meant crossing into insanity. And here I always thought British women were hot. Maybe it was Australian women I was thinking of. Where was Olivia Newton John from again? “Everyone in,” Elena said. “Ronovan, you first, backseat. Pile on the Ronovan time.” Okay maybe this wasn’t so bad after all. Wait, where was Hugh? Free Book Alert! This weekend only, The WorldMight is FREE!!!!! FREE BOOK ALERT! FREE BOOK ALERT! I have some GREAT news. Yeah, it’s a FREE BOOK! The heading up there might have given it away. I love free books. I know you remember Cyril Bussiere, author of The WorldMight who I interviewed not long ago. Well guess what. His book is FREE this weekend for download at Amazon! That’s right, I said FREE!! I’m downloading it and as soon as I read it I am going to put in a review of it. A couple of quick things from Cyril about the book that I didn’t ask him before. Yeah, I did an author interview and I didn’t ask much about the book. We know lots about Cyril though. Yeah, I still hate him . . . smart, plays guitar, and speaks French with the accent. RW: What genre doe s The WorldMight fall into? CYRIL: The WorldMight is a fantasy rich of mysteries, romance, and mysticism that unfold in parallel stories. RW: Tell our Reader Friends about those parallel story perspectives. CYRIL: One follows a mysterious prince walking the world in search of a mystical word; a word that has never been said, a word that would free his love from the clutches of a mythical beast. With love as his only fuel and compass, he will go further than humanly possible and overcome countless dangers and obstacles arising both around him and from within. The WorldMight also follows the story of Aria, the reluctant princess of the Kingdom of Alymphia, her best friend, Cassien, the weapon master apprentice, and her brother, the king-to-be Prince Hobgard, as they get ready for the upcoming Fall Passing Festival. The celebrations are fast approaching and merriment can be felt throughout the kingdom. But events that occurred decades prior are about to come crashing on their lives; events involving terribly powerful beings, the beloved and wise Master Baccus, and Aria’s father, the good King Hedgard. And once all is said and done, their world will be changed forever. I want to thank Cyril Bussiere for this quick description of his book The WorldMight that you can’t find on his website or Amazon, just right here. 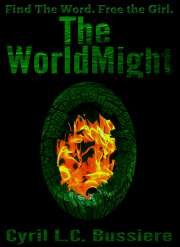 Remember July 26-17 you get The WorldMight FREE at Amazon for download. And when you finish reading it, be sure to give an honest review as thanks for the book. No, he didn’t ask me to say that. But hey, wouldn’t you want your friends to give a review? Click here to get the free Kindle App download and get Cyril’s book FREE! “It is the end of fall in the kingdom of Alymphia. Princess Aria and Prince Hob are readying themselves for yet another Fall Passing Festival. But unbeknownst to them, change is coming to the kingdom. Change brought on by dark forces and events that occurred generations prior. And those changes will unfold over their lives like a flood that nothing can stop. In another place and another time, a mysterious prince walks the world, trusted steel at his belt and a mystical stone imbued with magic at his neck. He is looking for a word that has never been said; a word that would save his love from the grip of an ancient beast. One of the very talented people I have come to know since starting up this site is Cyril Bussiere a Poet, Musician, Intellectual, and Author of The WorldMight, all of which I am jealous of. Renaissance man perhaps? We’ll go with that. Oh, and did I happen to mention Photographer as one of his gifts as well? Yes, I hate on him sometimes, because he’s just so good at everything. It doesn’t help that he is also French and so does that cool French accent thing. If I didn’t like the guy so much I might just throw myself under a bus, but then I would miss out on what next creation he came up with. I asked Cyril if he would be willing to do an interview and he kindly and generously said yes. I won’t waste much more of your time now. I’m just glad this isn’t in sound so I don’t have to hear the cool accent compared with my slow Southern accent, y’all. RW: Okay, Cyril, first thing first, where do we get a copy of your book, The WorldMight? CYRIL: At this moment it’s available at Amazon for Kindle. RW: Now that everyone has left the interview to buy your book I will ask a few questions. 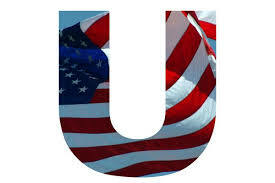 You were born and raised in France (yes he speaks French-for real, I was not just saying that earlier) and then came to the United States to continue your University studies, why? Why Utah and then Texas? Those are three very different environments I would think. CYRIL: This is a good question and worthy of a long answer. Right after high school I joined the University of Medicine in my home town. During Christmas that year I read On the Heights of Despair by Emile Cioran and it sent me into a rather deep spiritual and existential crisis in the light of which life, let alone school, became irrelevant. RW: I think we all get like that sometimes. But you came out of it, obviously. CYRIL: After a few difficult months, I gathered the tools to fend off the dark doubts and uncertainties that plagued me. My mother nonetheless decided a change of scenery was in order for me. One of my best friends from high school was already studying in upstate NY and so at the end of that year I joined him and enrolled in the small community college there. RW: That is seriously a loving Mom there. But that is New York, where does the Utah stop come in? A year later, it was decided that if I was to graduate, it might as well be from as good a school as possible. That’s when I moved to Salk Lake City, Utah, where I finished my B.S. in Biology at the University of Utah. After that I worked for a year at UC Davis as a lab tech (my old lab from U of U had moved there right before I graduated). In the meantime, I applied to grad school, mostly randomly, to places that had good funding for research. At the end of my year in California, I took a 4 months break and traveled South East Asia solo. I was in Bangkok when I got the news that I was accepted at UT Austin. I spent the next seven years there, getting my Ph.D. in microbiology. So to sum it up, it was mostly through chance that got me where I am. I knew almost nothing about all the places I moved to throughout the years and it’s all been great. RW: I’ll have to talk to you about South East Asia another time. That must have been amazing. But for not in regards to your writing, coming from more of a biological/medical background to now writing novels, are there medical aspects in your work, your literary creations? CYRIL: Not at all. My research was not medical, it was more basic science, how-does-this-work type of stuff. Although I’ve done a lot of scientific writing in my time, science has not influenced my creative writing. I do have a few ideas for potential novels that involve scientific aspects, but that’s in the ‘if and maybe’ realm. RW: Your parents were obviously great encouragers and supporters in your education, did they encourage your writing as well or perhaps a teacher saw something? Where does the writing influence come from? CYRIL: I’m not sure where it comes from. As far as I can remember I always wrote, though mostly short form and poetry. My parents always read a lot and I guess they passed it on to me, and that in turn inspired me to write. I think it comes down to a need for creative expression. RW: How would you describe your style of writing? You write poetry and have most of your writing life, now you write a novel, how different and challenging did you find it? CYRIL: My writing can change drastically from day to day, and that makes it difficult to assign it a style. For example my first novel, The WorldMight is a very poetic work, while the book I’m currently working on has a very crude and raw style. Going from poetry to novel was a daunting prospect I had shied away from all my life. The WorldMight was not planned as a novel. Initially, it just wrote the prologue one morning, it came to be on its own, and could have been just a longish fiction blog post. It came from a ‘free his love’ idea that I had almost two years prior and mostly everything else in these paragraphs was improvised. Somehow I kept on writing after it, and everything I created past that point, the world, its magical rules and the overarching plot flowed from these first words and ideas. RW: With the ‘daunting prospect’ and the ‘plot flowed’ comments being a bit at odds, how long did it take you to finish The WorldMight? I know the idea was probably daunting but apparently you flowed well once starting. CYRIL: It took about 14 months to write the first draft. A couple of months after I finished it, my wife and I took a nine months break to thru-hike the Pacific Crest Trail and do volunteer work in Nepal, so I didn’t touch it during that time. When we got back home at the end of last year, I got started on the editing process and that took another four months. RW: That is great to know. A lot of the ‘experts’ say you need to walk away from your manuscript for a period of time to then come back to it fresh. You mentioned a new project that is very different form The WorldMight. What is it that you are working on now and when can we expect it in our hands? CYRIL: Right now, I am working on a novel, BLUR. The story takes place in Austin, TX, and follows Barrett, a scientist and wannabe writer, and, Pete, the protagonist of Barrett’s first novel. In it I explore love, lust, and the effect childhood experiences have on intimate relationships. It’s a raw, sometimes graphic work, that’s very different from my first novel. I’m six chapters short of being done, so I hope to have it out by beginning 2015. RW: Very different idea from The WorldMight. But I’ve read some on your site, especially the short story series you have going called Vamp, which I have to say is very unique take on the Vampire idea, so I know there is a different side of your writing and that you like to break out and expose your different ideas. Now, Cyril, You wrote a novel for 14 months, what did you learn about yourself while writing The WorldMight? CYRIL: First thing would be that I can write a novel. That was not something I was sure of until the epilogue was finished. Second, that I don’t have much control over the writing process. It happens more than I make it happen. It’s both engrossing when it flows and utterly frustrating when it doesn’t. Third, that I pour a lot of who I am in my characters. They might be very different from me, but there’s always a crucial aspect about them that is a reflection of an aspect of my own persona. Sometimes, I don’t see it right away and it’s only on the umpteenth reread that it jumps at me, but it’s always there. RW: I share the same opinion. No matter how much you want to go in one direction it just goes where it wants to. Now, what did you learn about the writing while working on The WorldMight? CYRIL: That it’s hard. It’s like the blank page is my foe and we’re doing some kind of dance of seduction of the to-the-death kind and half the time I win and she bends to my will, and the rest of the time, I try and try but end up deleting hours of bad writing. But in the end, you just have to keep on going at it, keep the floodgates open, until something decent comes out. I find that often the good stuff is inspired by the crap that came before it. RW: Ah, when the floodgates don’t open what is your escape from writing when you are waiting for them to open again? CYRIL: Something mindless. 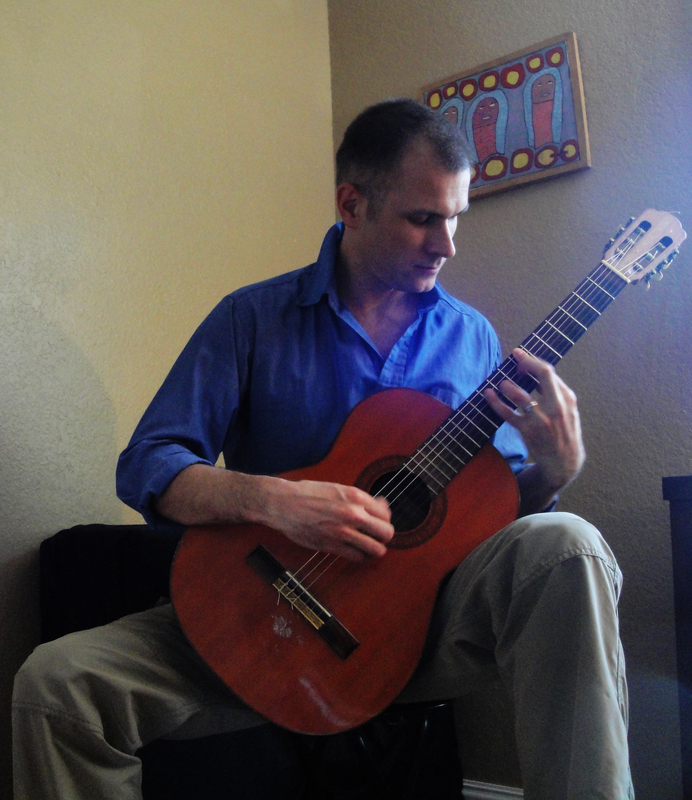 Right now I’m getting back into classical guitar after a five year hiatus, so I do a lot of that. I’m also involved with Big Brother Big Sister and my little lent me Grand Theft Auto V so I’m playing that too. RW: Obviously the floodgates opened, you revised, what was the most challenging part of getting your book to the public? CYRIL: The editing process was tough, especially cutting down 10% of it. It took me a while to come to term with the fact that I just had to, that great phrases that bog down the flow of a paragraph have to be axed without remorse, however beautiful they might be. RW: What advice would you give a first time novelist venturing into publishing a book? CYRIL: If in the writing stages, just do it. The confidence you’ll get from having written a book, whatever the quality, is utterly satisfying. If you have written the book, do your research and figure out who your public is, how to reach it and what your options are. RW: For me when I write I find lighting in my room influences how I write. You write songs, do you listen to certain kinds of music to help you write various scenes? CYRIL: I don’t usually listen to music while I write. I find it distracts more than anything else. However, I do listen in my head to the sounds and music, if there is some playing, of the scene. It helps me soak up the atmosphere of the moment and write the character’s reactions more naturally in the given context. RW: Writing does take time away from other aspects of life. What did your wife think of the time you had to spend writing The WorldMight? CYRIL: I’m a morning person and my wife is not. I wrote in the mornings, 5-7am, while she was still asleep, so it didn’t really impact her. RW: That works out great. Finally, what is your go to beverage while writing? CYRIL: A light beer like a Shiner or a Blue Moon. But they don’t last long. RW: I know you are currently unsigned by a literary agency, if you could hand pick one what qualities in an agent would you want? CYRIL: Since I enjoy writing in various styles and in different genres, flexibility would be important in an agent. Also, given my attachment to well written sentences, one who is ruthless when it comes to editing would be a definite plus. And of course someone who would know how to get my work in the right hands both publisher-wise and to reader-wise. I thank Cyril for agreeing to this interview. I must say he really agreed to help me out by doing so. My Friends here at RonovanWrites deserve to see the inside workings of getting to a goal and that real people write their dreams into reality. If you are a fan of Cyril’s poetry then you MUST get this book. Just read the reviews at Amazon and the excerpts as well and you will see mention of his poetic style. 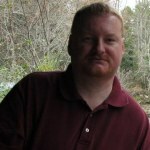 I ask everyone to make sure to visit Cyril at his site, cyrilbussiere.wordpress.com . You can also reach him by email at cyril.buissiere@gmail.com and of course as the whole of the world has a Twitter account, you can find Cyril there as well at @cyrilbussiere. Of course he and I are Twitter friends, and I also Follow his blog, so I’m not asking you to do anything that I don’t.